A simple, smart solution to what used to be a two-handed endeavor -- one hand and one squeeze of the Kebo and the bottle cap pops right off. It’s that easy. Kebo is the perfect brew of classic styling and effortless convenience in one carefully crafted device. Inspired by the Theodore Low bottle opener from the 1930s, this modern interpretation has been redesigned for improved function and timeless beauty by husband and wife team Rush and Judy Dixon of Rush3 Product Design Studio. With their background in architecture, it's no surprise that Rush and Judy created Kebo with quality, utility, and design all equally in mind. Cast of stainless steel and polished to a mirror finish, Kebo comes packaged in a keepsake tin making it the perfect gift for anyone with an appreciation for fine craftsmanship and of course, fine beer. Rush here from Rush3 Product Design Studio. As an Architect in South Carolina, I was compelled to pursue my interest in product design when the economy tanked in 2010. "Fascinated by function and inspired by simplicity" has been our mantra here. With that, we felt that Kebo® was a good choice for our first product as it combines two of our favorite things: modern design and cold beer. 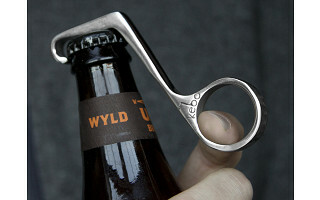 I look forward to answering any questions about our patented one-handed bottle opener. Cheers! Yikes $25 for what is a really interning but a novelty item. $15 is a more practical entry point into the market. It doesn't even give off a recorded quote from Uncle Si on Duck Dynasty!? Thanks for your feedback here. We carefully choose each of our Grommets and test them thoroughly. We chose this product to become a Grommet because of its beautiful, simplistic design with superior functionality. It's made of stainless steel and even comes with its own keepsake box. 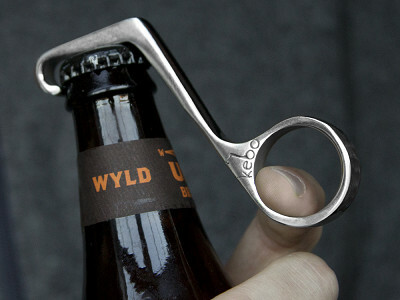 This, in our opinion is so much more than just a bottle opener. @Amy As I have aged, gracefully, I hope, I've come to appreciate the beauty inherent in that which is finely crafted. At that point price becomes purely subjective. Effective though it may be, a church-key can hardly be termed beautiful. As soon as my disability pension's limited disposable income permits a Kebo shall grace my wet bar. @ggreg sorry! interesting not interning! Has this been manufactured in the United States? Kebo was designed here in the U.S. and manufactured in China. If it has a magnet, will it cling to a refrigerator door? That's a good question. I'll see if we have one here in the office and I'll test it for you. Get back to you shortly. While the magnet is strong enough to hold a bottle cap, we wouldn't recommend it as a good option for the refrigerator door. A simple, smart solution to what used to be a two-handed endeavor -- one hand and one squeeze of the Kebo and the bottle cap pops right off. It’s that easy. Kebo is the perfect brew of classic styling and effortless convenience in one carefully crafted device. Inspired by the Theodore Low bottle opener from the 1930s, this modern interpretation has been redesigned for improved function and timeless beauty by husband and wife team Rush and Judy Dixon of Rush3 Product Design Studio. With their background in architecture, it's no surprise that Rush and Judy created Kebo with quality, utility, and design all equally in mind.